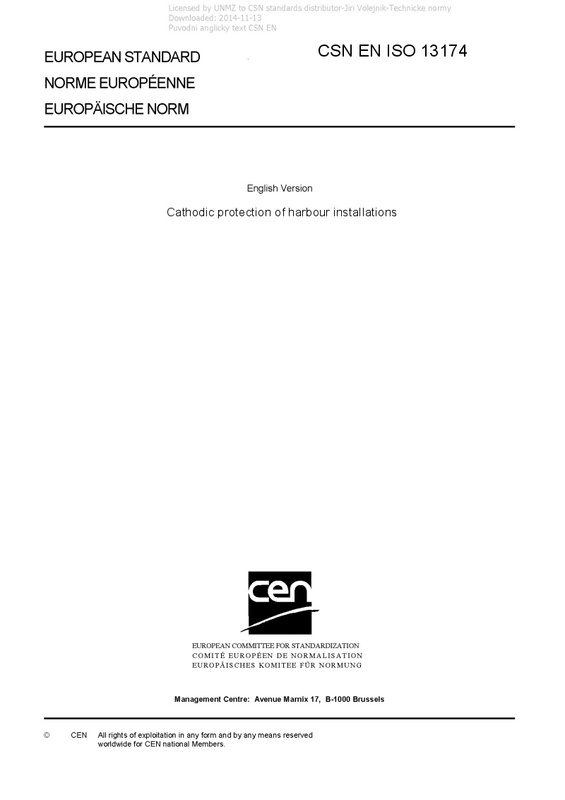 EN ISO 13174 Cathodic protection of harbour installations - ISO 13174:2012 defines the means to be used to ensure that cathodic protection is efficiently applied to the immersed and driven/buried metallic external surfaces of steel port, harbour, coastal and flood defence installations and appurtenances in seawater and saline mud to provide protection from corrosion. ISO 13174:2012 specifies cathodic protection of fixed and floating port and harbour structures. This includes piers, jetties, dolphins (mooring and berthing), sheet or tubular piling, pontoons, buoys, floating docks, lock and sluice gates. It also specifies cathodic protection of the submerged areas of appurtenances, such as chains attached to the structure, when these are not electrically isolated from the structure. ISO 13174:2012 is to be used in respect of cathodic protection systems where the anodes are exposed to water or saline mud. For buried areas, typically in soil or sand filled areas behind piled walls or within filled caissons, which may be significantly affected by corrosion, specific cathodic protection design and operation requirements are defined in EN 12954, the anodes being exposed to soils. ISO 13174:2012 does not cover the cathodic protection of fixed or floating offshore structures (including offshore loading buoys), submarine pipelines or ships. ISO 13174:2012 does not include the internal protection of surfaces of any components such as ballast tanks, internals of floating structures flooded compartments of lock and sluice gates or the internals of tubular steel piles. ISO 13174:2012 covers the cathodic protection of structures fabricated principally from bare or coated carbon and carbon manganese steels. As some parts of the structure may be made of metallic materials other than carbon steels, the cathodic protection system should be designed to ensure that there is a complete control over any galvanic coupling and minimize risks due to hydrogen embrittlement or hydrogen-induced cracking (see ISO 12473 ). ISO 13174:2012 does not address steel reinforced concrete structures (see EN 12696). ISO 13174:2012 is applicable to the whole submerged zone in seawater, brackish waters and saline mud and related buried areas which can normally be found in port, harbour, coastal and flood defence installations wherever these structures are fixed or floating. For surfaces which are alternately immersed and exposed to the atmosphere, the cathodic protection is only effective when the immersion time is long enough for the steel to become polarized. Typically, effective cathodic protection is achieved for all surfaces below mid tide. For structures such as sheet steel and tubular steel piles that are driven into the sea bed or those that are partially buried or covered in mud, ISO 13174:2012 is also applicable to the surfaces buried, driven and exposed to mud which are intended to receive cathodic protection along with surfaces immersed in water. Cathodic protection may also be applied to the rear faces of sheet steel piled walls and the internal surfaces of filled caissons. Cathodic protection of such surfaces is specified by EN 12954.